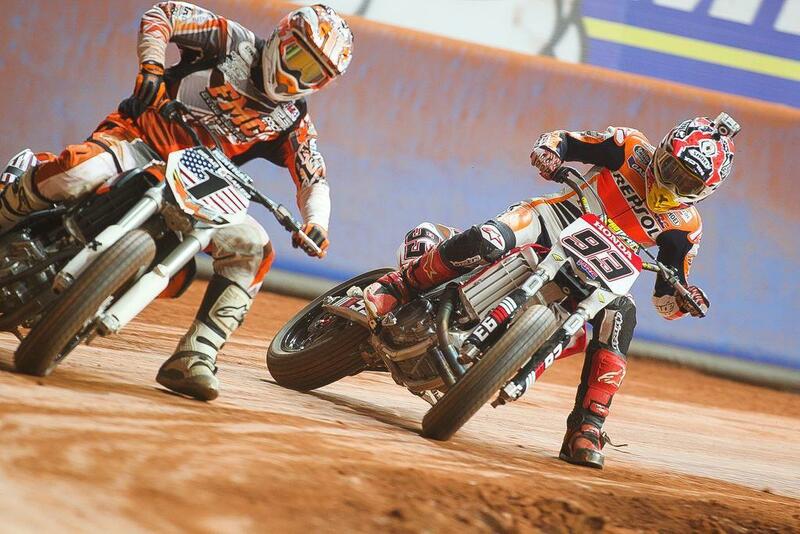 Some of the top talent from MotoGP have assembled in Barcelona for this weekend’s Superprestigio flat track race, with the entry once again led by double world champion and defending winner Marc Marquez. He’ll be joined by a host of mainly Spanish talent, though, with little brother and Moto3 world champion Alex Marquez joined by fellow world champions Tony Elias, Nico Terol and Julian Simon. Regular GP riders Mika Kallio and Alex Rins will be joined by World Superbike race winner Jordi Torres and European Superbike champion Carmelo Morales. There’s British interest in the race too, with 2014 finalist Oli Brindley joined by fellow British Dirt Track Championship winner Aidan Collins. However, the men to beat remains the visiting squadron of American flat track specialists, led by four-time AMA Flat Track champion Jared Mees and Brad Baker, the winner of the inaugural Superprestigio in 2013. The event will kick off at 1530 UK time in Barcelona’s Palau Sant Jordi, and will be available on live streaming in the UK on MotoGP.com.